How do I claim BSV? 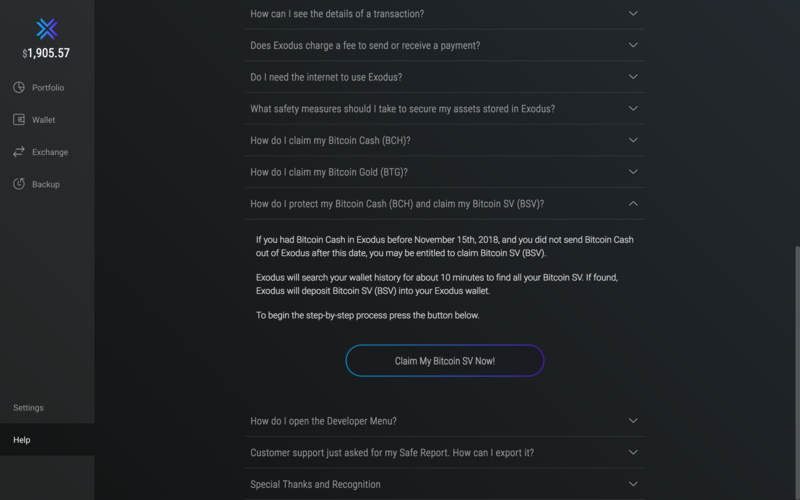 If you held Bitcoin Cash in Exodus before November 15, 2018, and you did not send your BCH out of Exodus after this date, you may be entitled to claim Bitcoin SV (BSV). Prior to this new BSV claim feature, sending BCH out of Exodus meant losing your BSV due to the lack of replay protection. Exodus has created a solution to add replay protection and protect your funds, but you must upgrade to the latest version! Do not send your BSV or BCH out of Exodus or attempt to exchange them until you have completed all the steps and the transactions have confirmed. IMPORTANT: There are some similar options in the wallet menus, so please make sure you select the correct ones. Click Help in the bottom left-hand column of your wallet. Scroll to How do I protect my Bitcoin Cash (BCH) and Bitcoin SV (BSV) and click the tab to expand the box and reveal more details. 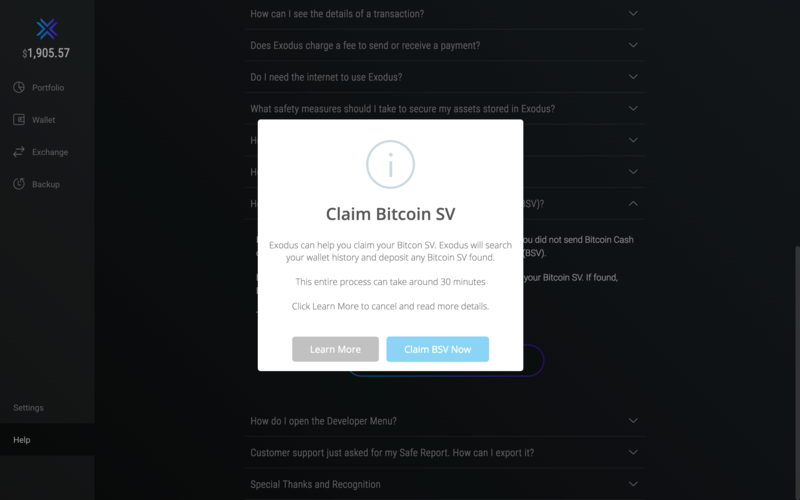 If you’ve already used Exodus to claim BSV, the option in the Help menu will not be available. Don't worry though! You can still use the function from the Asset Menu. 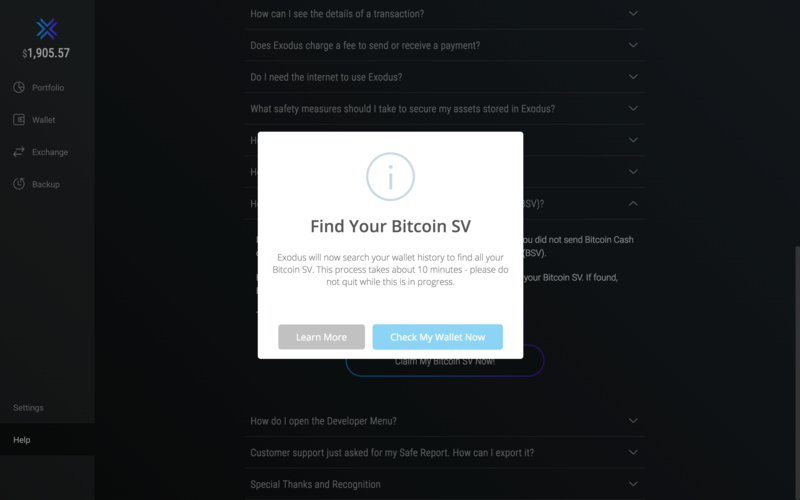 Simply head to the Bitcoin SV (BSV) section of your wallet, and click on the three dots in the upper right corner of your wallet to reveal the Asset Menu. 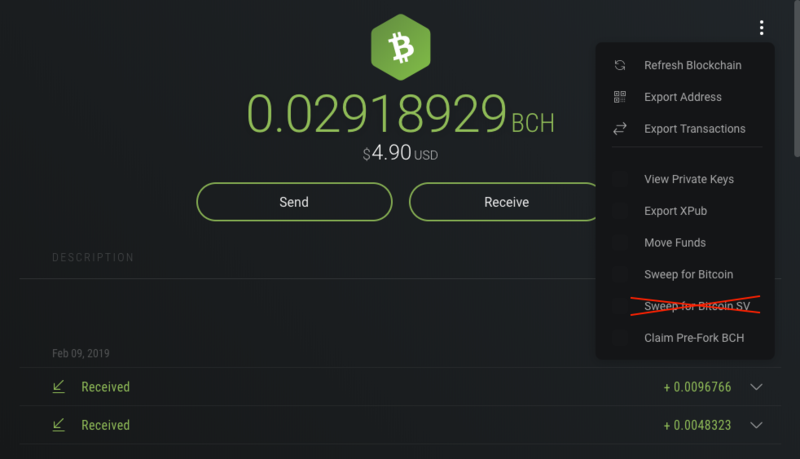 (If you don't see BSV in your wallet, you can enable it in Settings.) Then choose the Claim Pre-Fork BSV option from the Asset Menu. IMPORTANT: You must click the Claim Pre-Fork BSV option in the BSV wallet. DO NOT click the Sweep for BSV option in the BCH wallet. Doing so will not split your BSV and BCH coins and whenever you send one the other will be sent as well. Click Check My Wallet Now. 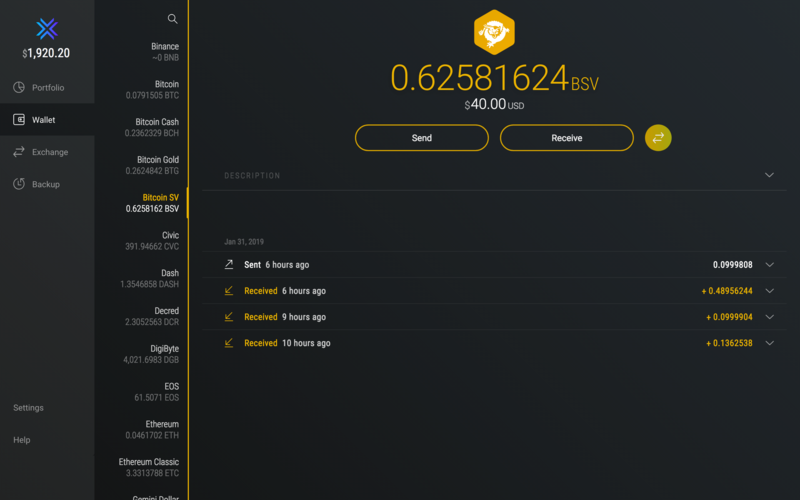 Once Exodus is done searching, it will display a pop-up letting you know how much BSV can be claimed, which is the total minus the transaction fees of sending the BSV to your wallet. Do not quit Exodus during this process! 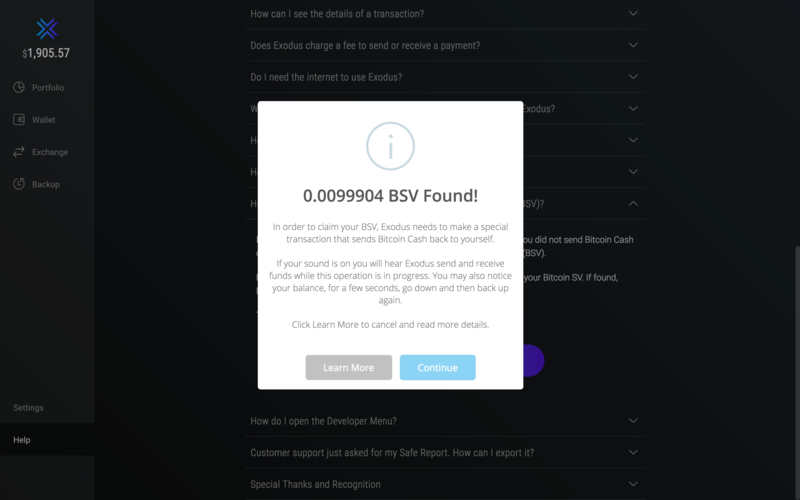 Exodus will begin to search your wallet history for BSV. Wallets with a long history will take longer than wallets with a short history. If you do not have a long wallet history, this process will likely not take any longer than a few minutes. 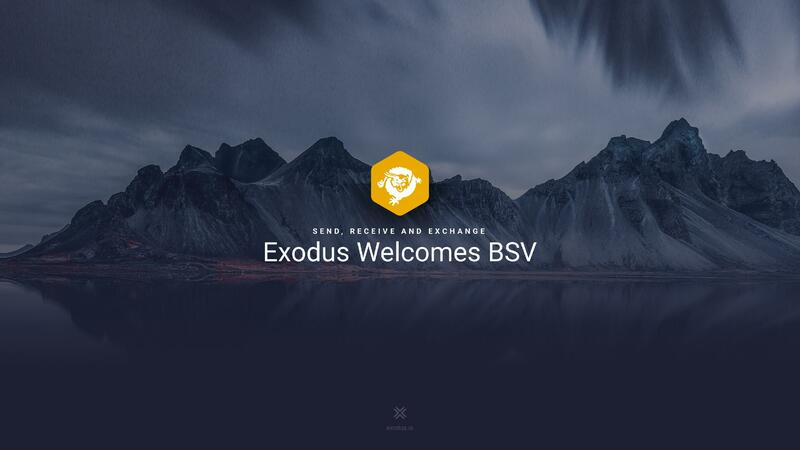 Exodus will split your BSV and deposit it straight to your wallet! This process will also enable Bitcoin Cash and Bitcoin SV in the exchange tab of your wallet if you wish to trade for any of the assets available in Exodus or acquire more BCH and BSV using your existing funds. If your sound is on you will hear Exodus send and receive funds while this operation is in progress. You may also notice your balance, for a few seconds, go down and then back up again. 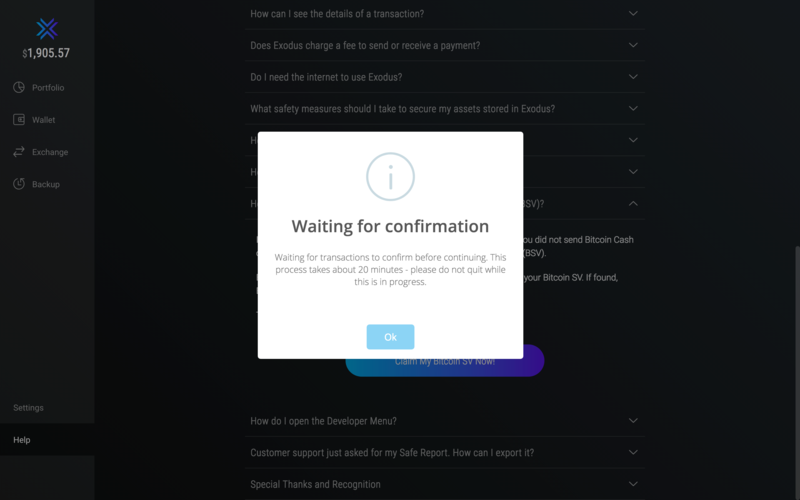 Exodus will display a message asking you to wait for confirmation of the split and replay protection transactions on the blockchain before allowing you to continue. This process should take less than 20 min. 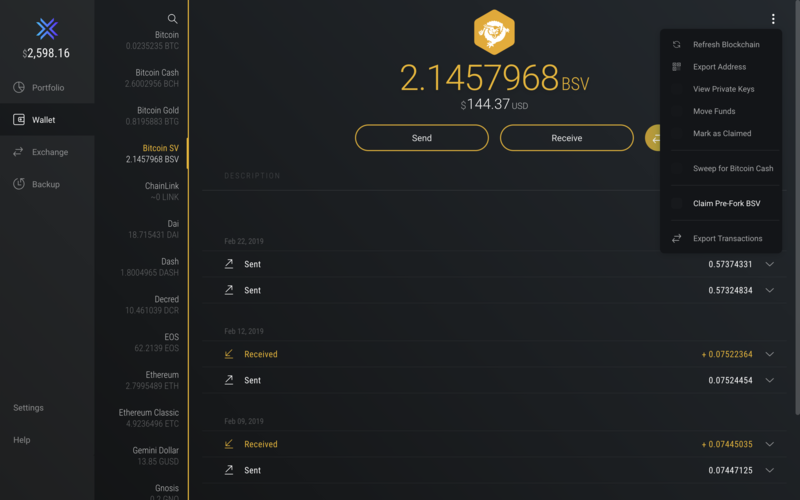 Click View Your BSV wallet to go to your newly created Bitcoin SV wallet!